Nice light SLA battery equivalence. Fits great in my fish flashers. Great Batteries and Great service!!! I’ve been using 4 of these for a aeration system in a pond running on solar. Flawless is a understatement. I have turned several people on to these. This is really a great deal for a great battery!!!! Awesome price and really good batteries. Thank you. 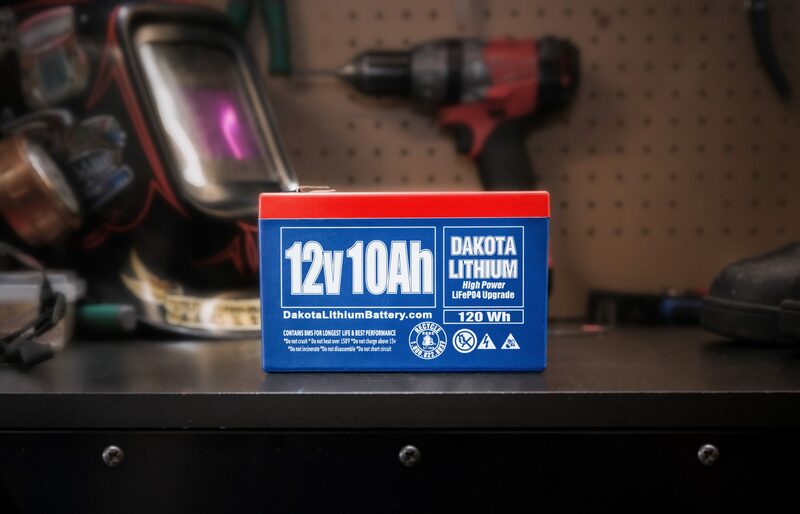 Super fast and effortless shopping with Dakota Lithium. I will definitely do business again. Thank you! I bought two for eZip 500 scooter. Scooter’s charger is designed for SLA batteries (2 12-volt batteries wired in series, 24-volt charger system plugs into the scooter), but since these have BMS that allows SLA charger to be used, I thought they would work. Charge and run fine in my two weeks of testing. Definitely more total energy capacity than the SLA (more runtime), but no more power for the uphill climbing. Overall a decent choice even if a bit more pricey than the SLA. I am expecting them to last much longer than SLA, but only time will tell if that is true. Running a 27 watt LED headlight on my MB. 8 to 9 hours of runtime. 4 to 5 hours recharge with CR supplied charger. Very pleased with performance. WOW! Lets me just say WOW! I have been using electronics on my kayak for 6 years now. Started with the simple 4 in Garmin, then a 5 inch, and now a 9inch Garmin 93sv, side scan, gps, down scan and sonar. Needless to say, the bigger the unit the more battery I needed. Used a 12v game feeder battery for a long time, but as the units grew, the battery wasn’t strong enough. 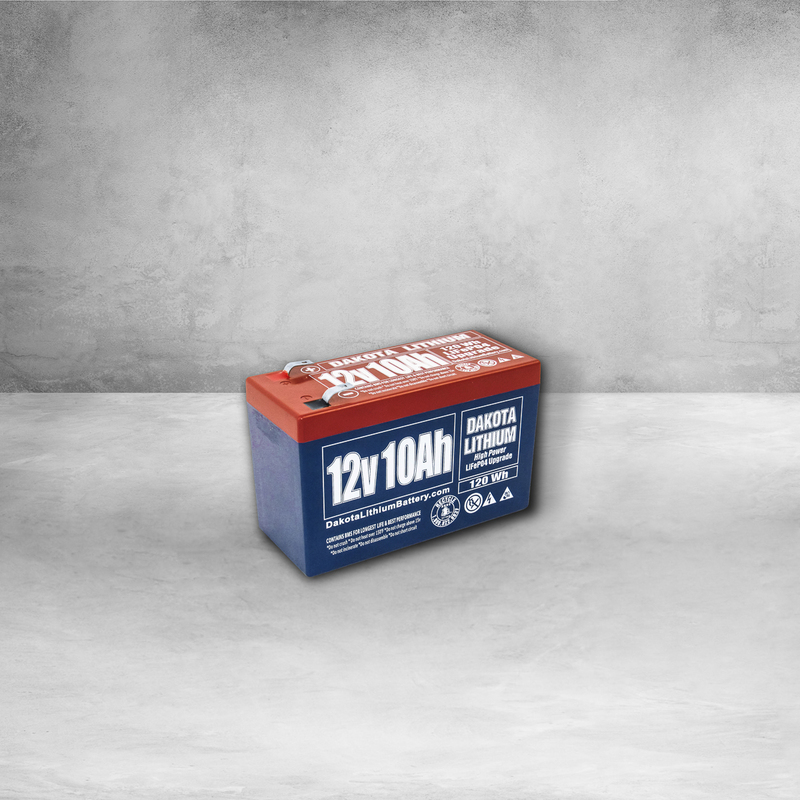 I upgraded to a 14AH Duracell, but it was so heavy and also barley made it through the day. I finally decided to try a Dakota Lithium 10AH. I cant explain how pleased I am. It runs my unit for at least 2 full fishing days on the water. It may go more, but I have not let it run dead yet. Not only that, but it is at least half the weight of a standard game feeder battery, If you fish as serious as me, 30-40 tournaments a year, any weight you can shave off the kayak helps!! Also, knowing I don’t have to worry, in hour 9, about my unit going dead is such a stress relief. Upgrading to this battery is the best upgrade I have made in a while!! Super pleased. Happy owner of two Dakota Lithium batteries. 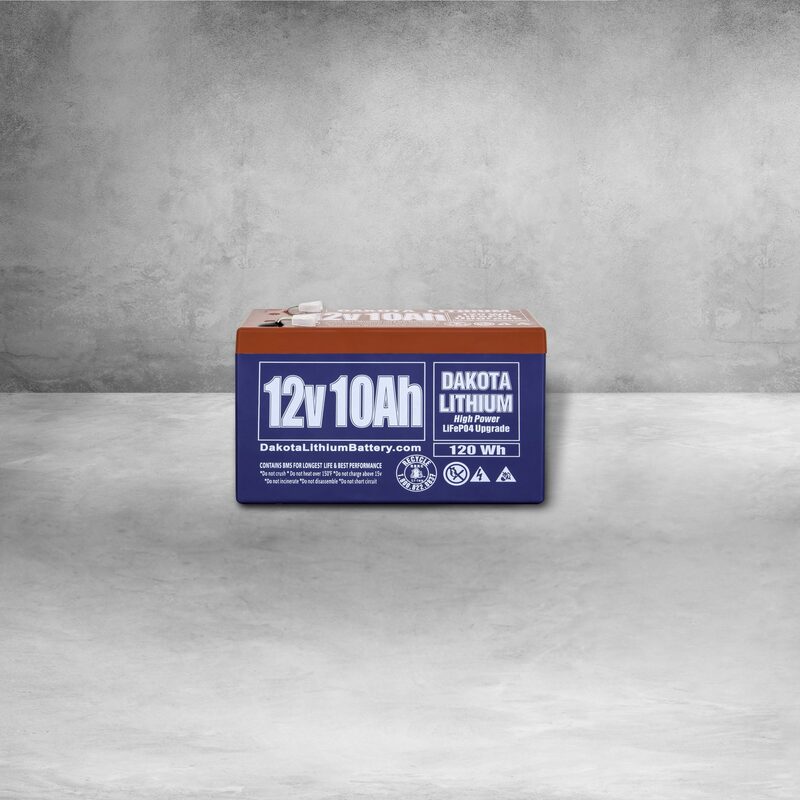 I’ve used two Dakota Lithium 10ah battery for two years now. In the winter in my ice fishing electronics, and in the summer to power my kayak electronics. 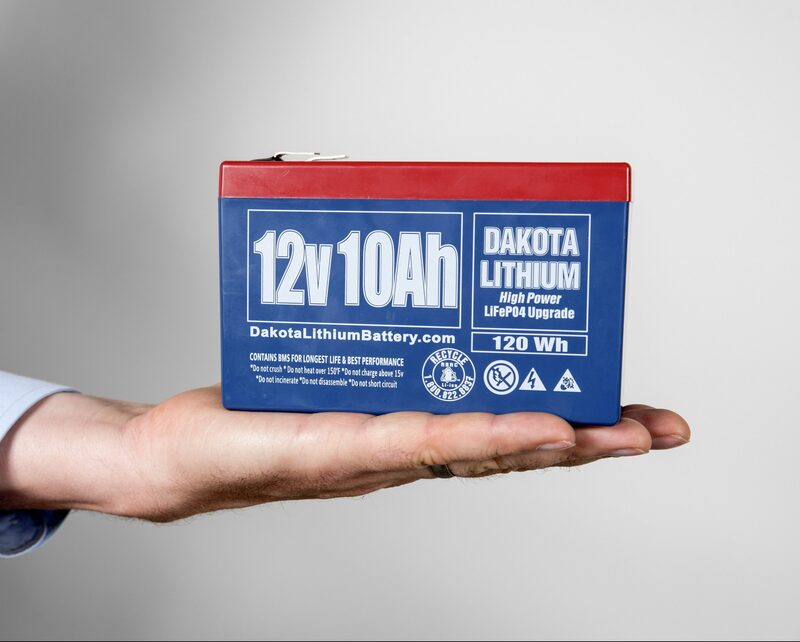 For those that ice fish, and stay very mobile, hole hopping with their electronics, this battery can’t be beat. Half the weigh of a 7ah SLA, and much better performance. I no longer need to worry about the life of my flasher through a day. My LX7 will run at full brightness from sunrise to sunset, and still have enough to fish several hours into the night. In addition to their great product, Dakota Lithium has graciously assisted me in sponsorship for an ice fishing tournament that I direct. They have been nothing but helpful with any concerns or issue with their product, and I will continue to support them in the future with my battery needs. Ideal off-grid. I’ve used this battery for over a year to power a small camping fridge/freezer. I keep it charged with a solar panel and LiFEPO4 regulator. It’s been very reliable and copes with some tough conditions here in the desert SW. I did have one problem with charging and their customer support was extremely helpful in resolving the issue. Excellent customer service.